After Sony Pictures canceled the Christmas day release of their comedy The Interview last week, hackers from Guardians of Peace (G.O.P.) 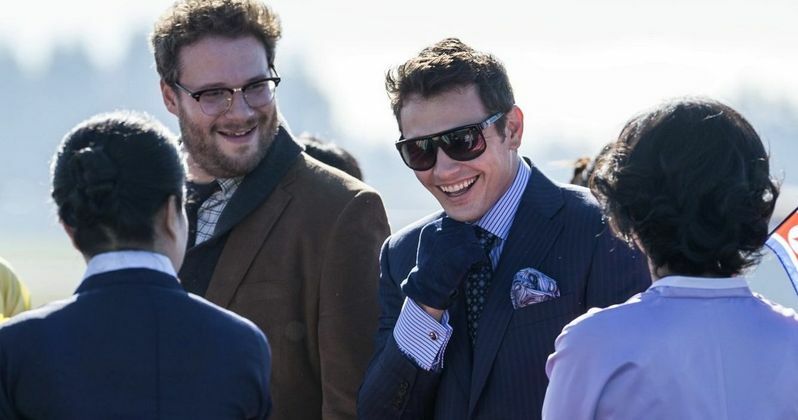 issued yet another statement demanding that the movie, starring James Franco and Seth Rogen, never be released in any way, shape or form, including Blu-ray, DVD or even online pirated versions. Sony later released a statement that they currently have no further plans to release The Interview, although studio sources have hinted that they may still offer the comedy through electronic sell-through, video on demand and other home entertainment venues at some point in the future. Even if those plans do eventually come to fruition, it seems unlikely that The Interview will ever be seen in theaters. Although today, a group representing independent arthouse theaters has reached out to Sony, asking the studio to let them screen The Interview. Art House Convergence, a group representing over 250 screens in art house theaters all over the country, issued an open letter to Sony Pictures' top executives Amy Pascal and Michael Lynton. The group also launched a petition on the website Change.org, asking other independent theater owners to pledge that they will screen The Interview. Here's a portion of Art house Convergence's open letter to Sony, written by the group's director, Russ Collins. "Your Art House motion picture colleagues wish to support you and your company. Circumstance has propelled The Interview into a spotlight on values, both societal and artistic, and in honor of our support, we want to offer our help in a way that honors our long tradition of defending creative expression. We understand there are risks involved in screening The Interview. We will communicate these risks as clearly as we can to our employees and customers and allow them to make their own decisions, as is the right of every American"
At this time, there is no indication that Sony will allow independent art house cinemas to show the movie. In related news, U.S. president Barack Obama made headlines last week, stating that Sony made a mistake by canceling the theatrical release of The Interview. The President also stated that the United States will, "respond proportionally" to the cyber attack that crippled Sony Pictures, which North Korea is being held responsible for. A new report from Deadline claims that the U.S. may have already responded by taking out North Korea's entire Internet system. Several reports coming out of North Korea confirm that the country's already-shaky Internet system is completely down. However, neither the White House nor the U.S. State Deparment would comment on whether or not the U.S. was responsible for this internet blackout. Doug Madory, director of Internet analysis at Dyn Research, said today that North Korea's internet services, which are provided through mostly Chinese networks, was hit with what appeared to be a DDoS attack, which hackers use to overload the network with traffic until it breaks down entirely.